The Stonecutters Bridge will be the world's second longest cable-stayed bridge when it is completed later this year. Brian West, the project manager, was kind enough to give me a tour when I visited Hong Kong in October. 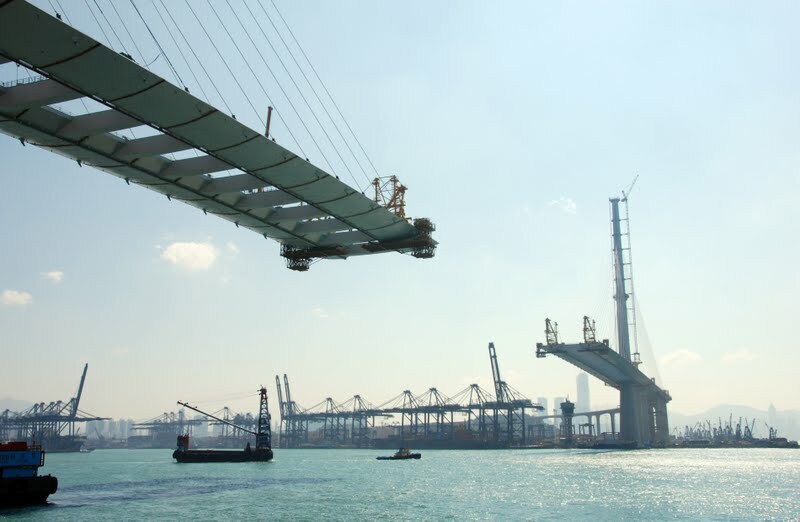 Cable-stayed bridges require a great deal of construction engineering. In fact, the construction engineering is often more challenging than the design engineering. The bridge will have a main span of 1018 meters from Tsing Yi Island to Stonecutters Island across Rambler Channel, the busiest shipping channel in the busiest port in the world. The bridge segments were manufactured in a factory in Shanghai, checked to make sure the segments fit together, and then disassembled and shipped to Hong Kong. Each bridge segment was brought into place on a barge, jacked up to the end of the superstructure, and attached to prestrung cables. The cables on the main span are 28 meters apart and on the back spans they are 18 meters apart. The back span is shorter to balance the bridge because the main spans are steel while the back spans are reinforced concrete. The soil conditions were different from what they originally assumed, resulting in a year's delay while they redesigned and built a pile cap with very deep piles for the towers. The towers were constructed using piggyback formwork and with a stainless steel shell above a certain level attached with shear studs. The main span superstructure was built with a gap to go around the towers. The towers are wider at the bottom, and so they have to carefully jack-up the superstructure to avoid it banging it against the bottom of the towers. The cables are made of parallel strands, assembled in the factory, and shipped to the site on big drums. The cables are impregnated with black high density polyethylene (HDPE). The outside is covered in a skin of white HDPE. They laid the cable out on the deck before attaching it to tower and deck. They attached little rollers to the cable so it wouldn't rub against the deck as it was lifted up onto the towers. The longest cable is 560 m. The superstructure has lock-up devices that allow temperature movement but will ‘lock-up’ for sudden movement such as a typhoon (or earthquake). Cable-Stayed Bridges: Stonecutters Bridge by Mark Yashinsky is licensed under a Creative Commons Attribution 3.0 United States License.